We have almost vacated the old house. I left a bunch of dishes in the dishwasher that I forgot to get. I am sorta sad as I will miss many things about that house in many ways. 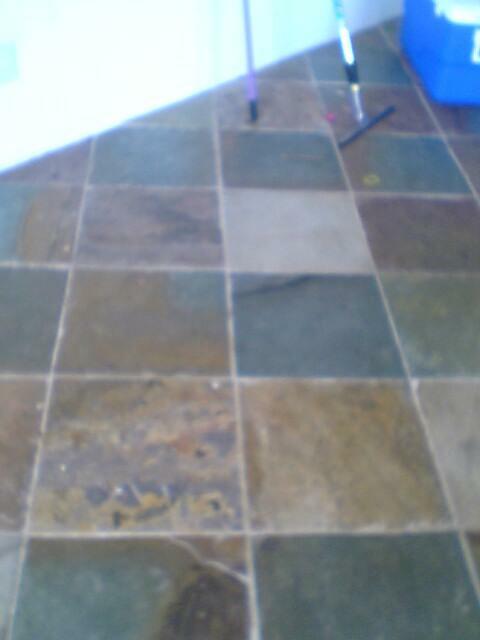 Yes, that slate floor is the main one. I had my first child there... or at least spent 17 weeks waiting at the front window for him to arrive... I mentioned this to Chris the other day and he pointed out the picture window and asked if I would miss the fights at that house or the memories of the dirt at that house and so on... I told him that even though I spent a long time looking out that very same window, that I was pretty sure that what, in the end, I would miss more, was just the view of our yard from that window. The birds playing in the sprinklers or in the pools of water... the gorgeous Palo Verde trees that were directly in front... I became close to that sight... it was what I saw for a long time (as in days in a row) and it became a part of me. BUT... I am thrilled to have a gorgeous house! We spent the first night in a hotel near the new old house. It is nice not having to unpack after all that packing, though I am fully aware that we have the mounds of boxes waiting for us when we do get there. The only boxes that are labeled are the ones I did or the ones I reminded Chris to do, so I feel like I am in for a surprise when it come s to that. Also, what is an acceptable amount of time to unpack? 3 weeks? 3 months? 3 years? I just can't wait till I can get in and work on the house! We got almost everything unpacked within two years. :) Most things immediately, but a few boxes lingered in the attic for a long, long while. It is my rule to never finish unpacking. This always leaves some boses with a surprise in them so that when one gets around to opening them, one at a time and after years, you will be shocked to realize how much you loved the things you never missed!